LARRY HURTADO: Review/Critique of Ehrman, Bauckham and Bird on Memory and Jesus. A newly-published article gives an incisive discussion of recent publications by Bart Ehrman, Richard Bauckham, and Michael Bird on memory, tradition and the historical Jesus: Alan Kirk, “Ehrman, Bauckham and Bird on Memory and the Jesus Tradition,” Journal for the Study of the Historical Jesus 15.1 (2017): 88-114. A PaleoJudaica post that involves Richard Bauckham's Jesus and the Eyewitnesses is here. THE ZIONIST ORGANIZATION OF AMERICA: ZOA Opposes Tillerson Decision to “Return” Jewish Artifacts to Iraq. The Jewish Press publishes a statement by ZOA president Morton A. Klein. I recently noted an essay by Dr. Berman about his book here. TALMUD WATCH: Memoir Provides Engaging Look at Talmudic Text (Marissa Stern, The Jewish Exponent). Can you imagine what you’ll be doing seven-and-a- half years from now? When Ilana Kurshan was coming off of a painful divorce, living in Jerusalem — she’d moved there from New York with her then-husband — a friend suggested she take up daf yomi, a practice in which you read one page of Babylonian Talmud a day. PaleoJudaica and its readers have been following Adam Kirsch's column on the Daf Yomi cycle for the last five years. UPDATE: Bad link fixed and attributions now filled in correctly. Sorry for the glitches. AT THE ACADEMY OF THE HEBREW LANGUAGE IN ISRAEL: Epic quest to document 'miracle' of Hebrew language (Mike Smith, AFP/PhysOrg). I noted the project here back in 2012. ACADEMIC JOB: Post-Doctoral Fellow in Eastern Christian & Islamic Manuscript Cataloging (posted by David M. Calabro at the Hugoye List). The Hill Museum & Manuscript Library (HMML) at Saint John's University invites applications for the full-time, benefit-eligible position of Post-Doctoral Fellow in Eastern Christian and Islamic Manuscript Cataloging. This position will provide vital support for HMML's efforts to catalog recently digitized Eastern Christian manuscripts. Under the guidance of the Lead Cataloger of Eastern Christian Manuscripts, the Cataloging Fellow will undertake original cataloging of digital surrogates at HMML as well as revision of existing cataloging. This is a grant funded position through June 30, 2018. The manuscripts are in Arabic, Garshuni (Arabic written in Syriac script), and possibly in Syriac. Follow the link for further particulars. There is no specific closing date, but don't dawdle. For some background on HMML, see this post on an earlier postdoc there. Ancient Judaism receives at least a little attention in this volume. I don't know if that is right, but it sounds plausible. For many past PaleoJudaica posts pertaining to the Arch of Titus, as well as to ancient menorahs and representations of menorahs, start here and follow the links. THIS WEEK'S DAF YOMI COLUMN BY ADAM KIRSCH IN TABLET: On Capital Punishment. Talmudic rabbis pondered the most fundamental ethical questions—including the value of human life—in debating death sentences by hanging or stoning. As Mr. Kirsch notes in the essay, the rabbinic discussions of capital punishment are entirely theoretical. Rabbinic courts did not have the authority to impose the death penalty. Philologos has a recent essay on the saying "Whoever Saves a Life Saves the World," which I noted here. The phrase "from Israel" may be a secondary addition. STATE DEPARTMENT ANNOUNCEMENT: U.S to Return Jewish Artifacts to Iraq, Despite Protests. The trove includes books, religious texts, photographs and personal documents looted during Saddam Hussein's regime, and then found by U.S. troops in 2003. (JTA via Haaretz). A trove of Iraqi Jewish artifacts that lawmakers and Jewish groups have lobbied to keep in the U.S. will be returned to Iraq next year, a State Department official said. As the headline indicates, response to the decision has been mixed, but generally not very positive. I have expressed my own thoughts on the matter here and here and I have nothing to add. We'll see what actually happens. It isn't over until it's over. Further background on the story is here with links going back to the recovery of the archive in 2003. RABBI UZI WEINGARTEN: “Cursed Is One Who Does Not Uphold the Words of This Torah”? (TheTorah.com). Rabbinic exegetes found the curse difficult, but the Apostle Paul put it to use for his own purposes. 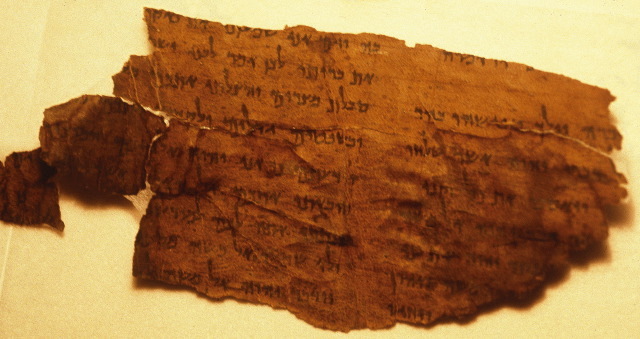 ANCIENT JEW REVIEW: Reading the Scrolls and Experiencing Qumran Archaeology with Hanan Eshel (Joshua Matson). Hanan Eshel, Exploring the Dead Sea Scrolls: Archaeology and Literature of the Qumran Caves, edited by Barnea Selavan and Shani Tzoref. Journal of Ancient Judaism. Supplements, 18. Vandenhoeck & Ruprecht, 2015. The volume itself is a testament to the legacy of Hanan Eshel in the field of Qumran studies and the history of the Qumran caves. Additionally, this volume serves as a gift from his closest friends and partners in scholarship to the world as a lens through which to view the history of the Dead Sea Scrolls. ARCHAEOLOGY: EXCLUSIVE: New Archaeology Shows ‘Refugee Camp,’ Not Just Rebels, Atop Masada (Ilan Ben Zion, The Forward). Tour guides leading thousands of visitors to Masada each year follow a similar routine: Where Roman troops breached the walls, they retell Josephus Flavius’s account of how a group of obsessive, fanatical Jewish rebels refused to concede to servitude or slaughter, and committed suicide instead. For decades, archaeology at the site has been calling the story of the suicide, so central to Israel’s national myth, into question. Now new discoveries may force a revision of the notion that the group atop the fort was much more diverse than the heroic band of brigands celebrated by the cherished story. Cutting edge archaeological techniques helped glean a more detailed picture of the past that would have been impossible during Yadin’s time. The picture emerging from these new data about Masada’s inhabitants is far more complex than previously assumed. “It’s not one monolithic group,” Stiebel explained, describing the people living at Masada before its fall “very vibrant community of 50 shades of grey” of Judea. “We have the opportunity to truly see the people, and this is very rare for an archaeologist,” he said. Among them are women and children, who are too often underrepresented in the archaeological record. Through archaeology, the study of the material culture found on Masada, architecture and a restudying of Josephus, he and his team can even pick out where different groups originated from before coming to Masada. It sounds plausible that a range of refugees could have ended up seeking safety at Masada during and after the Great Revolt. The new and interesting thing about the current excavation is the use of sophisticated technology to squeeze vastly more information out of the material remains than was posssible in Yadin's day. We will have to wait for the peer-review publications to find out exactly what the excavators have learned. It remains to be seen how much the new information will make us reconsider Josephus's account of the fall of Masada. It certainly was not without problems already. The article also reports that some new Hebrew ostraca have been recovered. For past posts on the history and archaeology of, and revisionist views on, Masada, start here and here and follow the links. BRYN MAYR CLASSICAL REVIEW: Liv Ingeborg Lied, Hugo Lundhaug (ed. ), Snapshots of Evolving Traditions: Jewish and Christian Manuscript Culture, Textual Fluidity, and New Philology. Texte und Untersuchungen zur Geschichte der altchristlichen Literatur 175. Berlin; Boston: De Gruyter, 2017. Pp. xviii, 366. ISBN 9783110344189. $137.99. Reviewed by Pieter W. van der Horst, Utrecht University (pwvdh@xs4all.nl). The 13 essays in this volume aim to provide “a broad introductory exploration of the applicability of the perspective of New Philology to late-antique Christian and Jewish texts in their manuscript contexts” (vii). In the introductory chapter the editors clarify the idea of ‘New Philology’ by arguing that when scholars of early Christian and Jewish literature acknowledge the fact that our surviving textual witnesses constitute in fact only snapshots of a movie about a developing textual tradition and that such snapshots are not necessarily representative of the entire movie, “it is pertinent to approach the interpretation of these texts from a perspective inspired by New Philology, taking textual fluidity and manuscript culture fully into consideration” (1). This is meant as a corrective to the traditional approach in which manuscripts are used only, or mainly, in the service of the reconstruction of an Urtext and in which variant readings are regarded as ‘deviations’ from it. Manuscripts are rather testimonies to the ‘life’ of a text, and in most modern critical editions of ancient literature the text presented is usually “foreign to the pool of existing manuscripts and the texts presented there” (3). The ‘unruliness’ displayed by actual manuscripts is thus made invisible, much to the detriment of scholarship. Fluidity of the texts should not be regarded as textual ‘corruption’ because ‘living’ texts were altered in the course of transmission to suit new times and needs. By hiding variants in a critical apparatus one also hides the fact that in a manuscript culture texts are constantly in a process of change. “As an alternative way of dealing with medieval manuscript variance New Philology pinpoints the fact that a literary work does not exist independently of its material embodiment, and that this physical form is part of the meaning of the text” (6). A ‘finished’ text is an illusion, for the changes introduced to the text during its transmission are not corruptions but should be studied as important aspects of the life of the text. I was pleased to see that the reviewer liked my essay on the Hekhalot literature, the last one in the volume. Past posts on the book are here and links. YESHIVA UNIVERSITY: The Arch of Titus – from Jerusalem to Rome, and Back.September 14, 2017 - January 14, 2018. Popper Gallery. Presented in partnership with the Yeshiva University Center for Israel Studies . An international conference presented in partnership with the Yeshiva University Center for Israel Studies will take place on October 29, 2017. HT the Bible Places Blog. For more on the research behind this exhibition, see here and links. BIBLE HISTORY DAILY: New Testament Political Figures: The Evidence. A web-exclusive supplement to Lawrence Mykytiuk's BAR article identifying real New Testament political figures. There are 23 externally verified political figures on this list, to go with Dr. Mykytiuk's 53 epigraphically verified persons in the Hebrew Bible. You need a paid subscription to read the BAR article, but this supplement is quite thorough. APOCRYPHICITY BLOG: Christian Apocrypha at SBL 2017. Tony Burke gives us a preview. THE BIBLE PLACES BLOG: Luke & Acts (8): John the Baptist (Michael J. Caba). This continues the series that was formerly called "Historical Reliability of Luke-Acts." Past PaleoJudaica posts on Machaerus are here and links. For a skeptical response to the claim that the bones of John the Baptist are in Bulgaria, see here. ETC BLOG: Jechoniah’s Uncle and the Text of 2 Chron 36.10 (Peter Gurry). The discussion continues in the comments. I agree with John Meade that "brother," the more difficult reading of the Masoretic Text, is the more original reading.